Scarface is a 1983 epic crime drama film directed by Brian De Palma, written by Oliver Stone, and starring Al Pacino as Tony Montana. Based on Howard Hawks' original 1932 film of the same name, the film tells the story of a fictional Cuban refugee who comes to Florida in 1980 as a result of the Mariel Boatlift. Montana becomes a gangster against the backdrop of the 1980s cocaine boom. 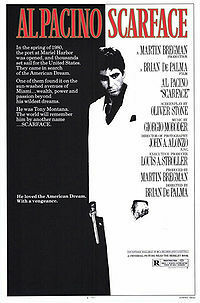 The film chronicles his rise to the top of Miami's criminal underworld and subsequent downfall in tragic Greek fashion. The film is dedicated to Howard Hawks and Ben Hecht, who were the writers of the original 1932 film. The critical response to Scarface was mixed and the film received criticism for its violence and graphic language. Despite this, it did well at the box office and has since gathered a phenomenal cult following. The film has become an important cultural icon for many fans, inspiring Motley Crue's Dr. Feelgood, posters, clothing, and many other references, especially in gangsta rap. The film's grainy black and white poster is a very popular decoration and is still in production, and as a result of its popularity has been parodied many times.